Never in over two decades have I witnessed such a zealous reaction to a new creative team and a publishers first-ever graphic novel in advance of publication. I kicked off our campaign on Friday 1st February and within a mere 36 hours wed received 25 pre-orders. I am delighted to the report that rose to 50 pre-orders and the book is in stock now! Although we did sell out of our 100 limited edition signed bookplate editions in 10 days!. My favourite covers tell a story begging questions, and Ive stared at this beauty for ages. Within its crisp, white, sinuous Art Nouveau frame redolent of Alphonse Mucha stand two figures, with a third glimpsed through the ornate window beyond: a porcelain bird gleaming against a midnight-blue sky, runes encircling its neck. 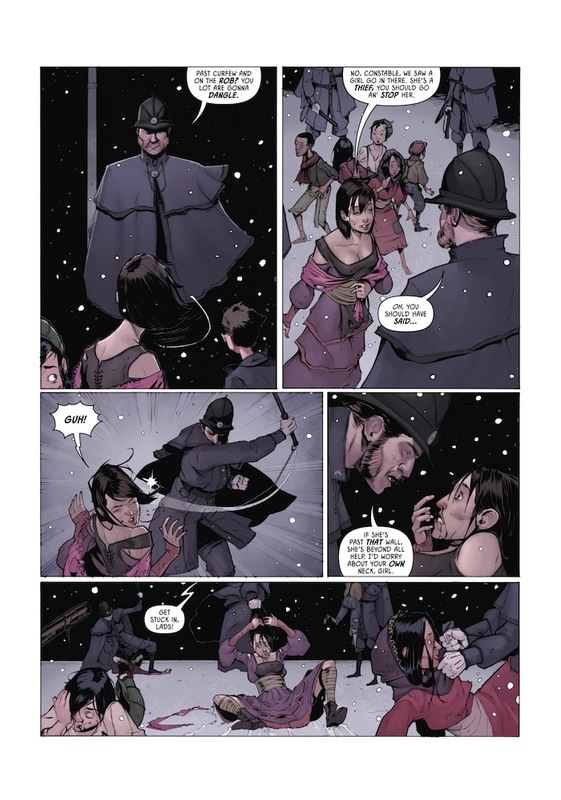 A young girl clad in rags glares suspiciously, defiantly to one side while an imposing, opulently clothed, walrus-like man with a thick, grey-flecked beard gazes down upon her, his expression impossible to read. Is it paternal or possessive? The art is majestic with huge landscape flourishes, while the colouring is to cry for through and through. 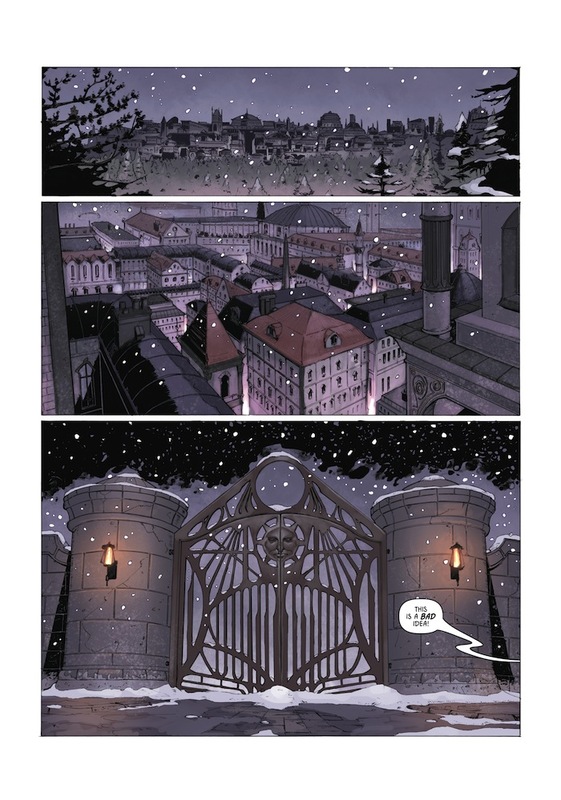 Chris Wildgoose and André May have done a bang-up job: gas lamps glow on a cold winters night; the Makers beard is as lush as anything drawn by Paul Smith, and summer gardens seem to go on forever underneath the pink and purple wisteria. Wait until you see the guard dogs: the silver, panther-like automatons shining in the night, their eyes glowing as though powered by a furnace within. 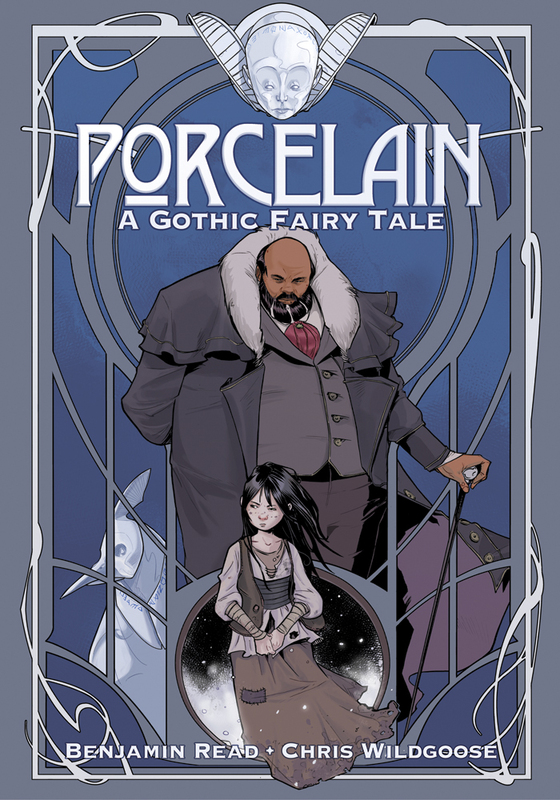 Sub-titled A Gothic Fairy Tale, PORCELAIN opens high above the snow-swept rooftops of a wealthy European city before settling in front a wrought-iron gate firmly locked against intruders. Outside its walls a boisterous crowd with no homes to go to have gathered in torn and tattered, patched-up clothes far too thin to keep the cold at bay. The bad ideas to break in. before hopping, helter skelter, down the branches of an ancient tree. Cue wolven guard dogs and the mansions owner (he from the cover, yes). Cue police brutality on the other side of the garden walls. But what follows next is far from predictable, as the Child bluffs her way out of trouble and into the heart and house of the Porcelain Maker. Well how have you got all the money, then? Love the expression when he learns of his reputation: not alarmed, but genuinely startled. 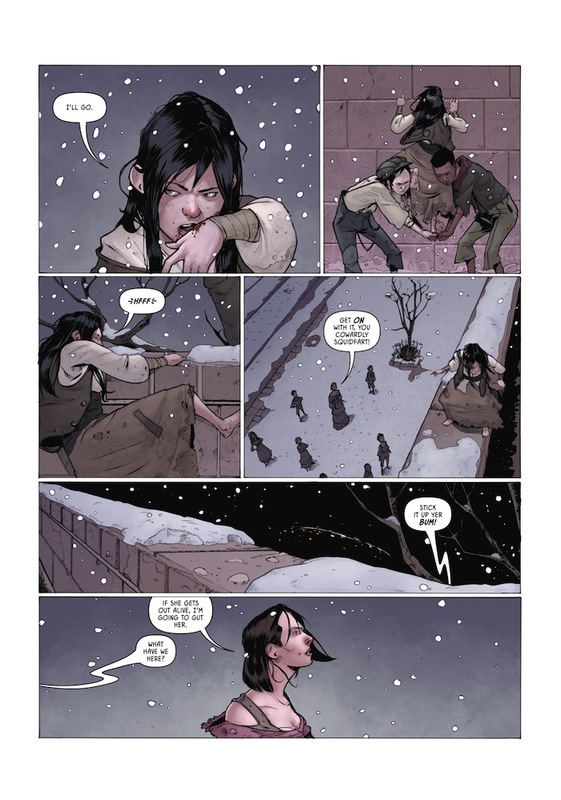 Also, theres a perfect piece of comicbook juxtaposition when the child asks if he achieved his first ambition, and he merely replies no without further explanation, Read wisely leaving Wildgooses picture to tell a thousand words. Theres quite a lot in that portrait. What is revealed is that there is no one else living at home. Oh, there are butlers and cooks and assembly-line workers crafting the mans wares in the small, on-site factory, but like the family pets they are all fashioned from living porcelain. Hes old and hes lonely so he invites her to stay and, in spite of her obvious bluff about brothers waiting outside the walls, she really has nowhere to go. Oh, just one prohibition. The alchemical glaze used to breathe life into the china creations is a closely guarded secret know only to the Porcelain Maker and, understandably, hes ever so slightly protective of it. The final process takes place beyond a locked door and that door must stay locked. The child must never stray inside. Tip of the proverbial iceberg: youre little more than a dozen pages in. What follows is a delightful exploration of a singular relationship as the Porcelain Maker takes great joy in the young girls education and our spirited madam pushes all sorts of boundaries. 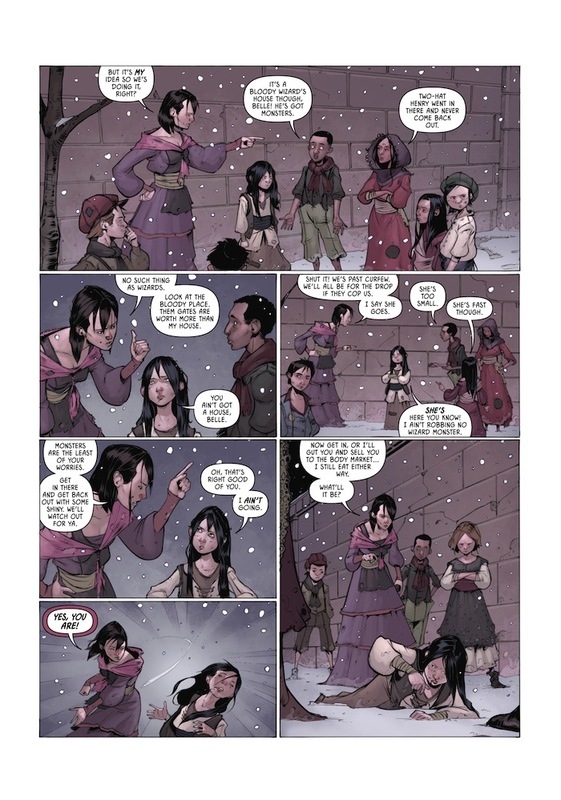 There are lots of little background jokes when she cannot resist embellishing his creations in her own inimitable fashion, and I hadnt realised until reading the wealth of extra material at the back that Wildgoose designed and employed roughly a dozen different outfits and hairstyles just for this nameless Child. The young girls spirited voice is perfectly pitched, with expressions like Get out of it! and customs like Spit on it! and obviously there will be downs as well as ups. But there will also be a multitude of further construction on the craftmans part, all of it magical, as well as the constantly diverting give-and-take between our mismatched pair.